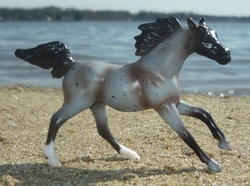 Blue Toxic One-1981 black roan. Sired by Blue Valentine (r), out of Imatoxicone. CM Breyer SM done by Ariel Williamson. Sylvanas-1984 red roan Quarab. Sired by Two ID Bartender-r, out of Silvanity-r.
1989-Lady Windrunner, red roan sabino filly (x Sith Master, Arab). 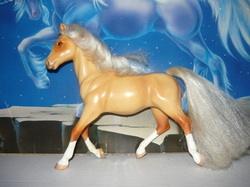 Lady Windrunner-1989 red roan sabino. Sired by Sith Master (arab), out of Sylvanas. Itsa Wraith-1994 palomino. Sired by Dunit Golden, out of The Red Wraith (QH). Meet Me There-1994 chestnut. Sired by Rendevous (Arab), out of Marsala San Badger (QH). 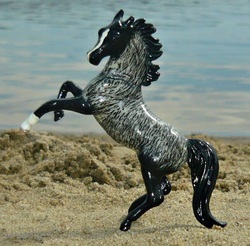 Bred by Shadow Wolf Stables. Ebon Watcher-1996 red dun roan sabino. Sired by King N Doc Dun Tuffy-r (QH), out of Lady Windrunner. Katla-1999 palomino. Sired by Krakatoa (arab), out of Itsa Wraith. 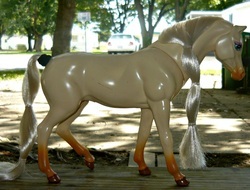 OF Breyer Classic, AQHA foal (Palomino Morgan and foal set). 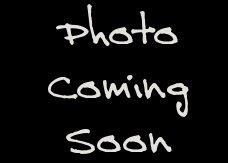 Celestial Fortune-2003 gold champagne Quarab mare. Sired by Silver Deception (Arab), out of Sweet Champagne-r Bred with the help of Tier Foret. Hekla-2004 buckskin. Sired by Set (Arab), out of Katla. The Golden Warden-2006 palomino. Sired by Knight of Ebon Hold, out of Golden Destiny. Bred with the help of Shadow Wolf Stables (dam owner). She's got some mud spots on her. 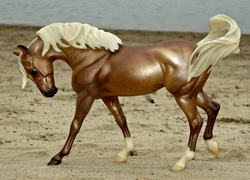 Celestial Rebel-2009 palomino. Sired by Iraz (QH), out of Celestial Fortune. Star Firefly-2009 palomino Quarab. Sired by Dun Gotta Star (QH), out of KSW Emerald (Arab).